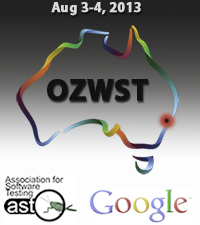 Dean Mackenzie has written a fantastic report of OZWST 2013 in the latest issue of OZTester. The AST Grant Report for OZWST 2013 has been published. Big thanks again to the AST for sponsoring the event. Planning for OZWST 2014 is already underway. Well, OZWST is over for another year. 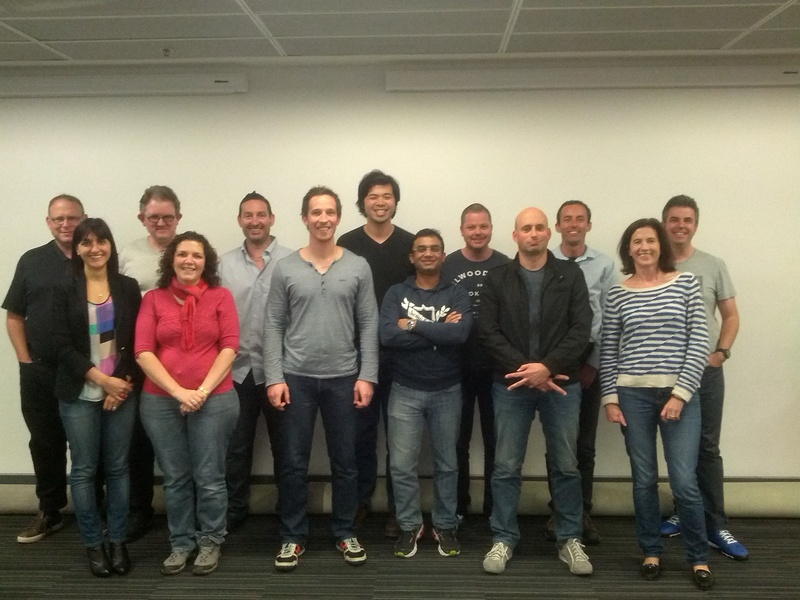 It was a fantastic couple of days at Google HQs in Sydney, Australia. More details will be shared soon, along with a full AST Grant Report in the coming weeks. L-R: Rob Sabourin, Ale Moreira, Erik Petersen, Kim Engel, Scott Griffiths, David Greenlees, Paulo Lai, Rajesh Mathur, Mark Tolfts, Richard Robinson, Lee Hawkins, Anne-Marie Charrett, Andrew Dempster. Absent from photo was Dean MacKenzie. Photographer was a special guest all the way from Sweden who joined us on day 2; Henrik Andersson. OZWST 2013 is almost upon us! Well, we’re about 3 weeks out from OZWST 2013 and I’m getting quite excited. This year’s theme is ‘Collaboration in Software Testing’. This is quite a broad theme, so I’m looking forward to some great conferring on almost ANYTHING we do in software testing! A quick thank you to both the Association for Software Testing (for the catering via their Grant Program) and Google (for the use of their HQs in Sydney). A Grant Report similar to last year’s will be written post the event so please keep an eye out for that. It’s this kind of enthusiasm and passion that our craft needs! Testers out there should take note of Dean’s post and what it really means… it’s powerful. HUGE thank you to Andrew Dempster for the hours of work required in creating these. 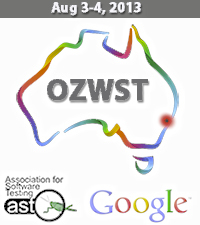 Well, progress has been made… the OZWST 2013 invites have been sent today. I’ll post a final attendee list as soon as it’s confirmed, however it does give me great pleasure to announce our international guest Content Owner, Mr Rob Sabourin. I’m very excited that we’ve been able to make this work. As you can imagine it’s not a cheap trip from Canada to Australia, but with the help of my colleagues we’ve been able to nail it. Theme – Collaboration. Although broad sounding, this will be a powerful theme when controlled by Rob. It is an essential part of our roles and it will be very interesting to hear stories of success and failures. Venue – Google HQs, Sydney. Date – August 3 and 4, 2013. Each attendee will come prepared with an Experience Report (ER) and hopefully we can get through most of them (a hard task for a two day event). While on the subject of ER’s, check out this video of Rob’s description of an ER. Once again the AST have been kind enough to sponsor the event through their Grant Program. Also, a bit thank you to Google for the use of their wonderful HQs in Sydney. Looking forward to a fantastic couple of days!